Zohara Khatun is still reeling from the trauma of seeing her father killed in western Burma in June. "My father was shot dead by the Burmese military in front me. Our entire village was destroyed. We ran for our lives. I still don't know what happened to my mother," she said, sitting in a thatched hut in a fishing village near the town of Teknaf in south-eastern Bangladesh. 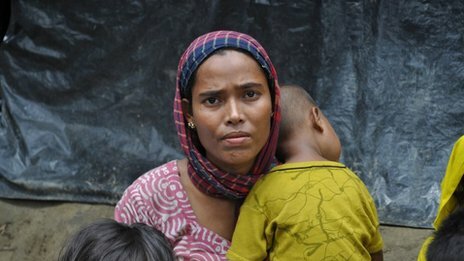 Ms Khatun is one of the Rohingya Muslims who have managed to cross into Bangladesh following the communal unrest in western Burma's Rakhine province. The 30-year old broke down repeatedly as she tried to explain what happened over the border. She says their village came under attack during clashes between majority Buddhists and local Muslims, mostly from the Rohingya minority. Nearly 80 people were killed in the fighting and thousands were displaced. Human rights groups allege that Burmese security forces continue to carry out mass arrests, forcing many Rohingya Muslims to flee. A state of emergency declared last month is still in force in many places of the province. There is no independent confirmation of the claims of extra-judicial killings and other abuses - journalists are denied access to the area. Burma denies its security forces are responsible for human rights abuses. Since the June clashes, many hundreds of refugees have been trying to get into Bangladesh, taking perilous boat journeys along the Bay of Bengal and across the river Naf, which separates the two countries. "We were floating on water for six days. I could not feed my children for days," Ms Khatun said. "When we tried to reach Bangladesh, we were not allowed to enter. We did not know where to go." There are an estimated 800,000 Rohingya Muslims living in western Burma. The Burmese authorities argue that the Rohingyas are recent migrants from the Indian sub-continent. But Dhaka says they belong to Burma, so they are not welcome in Bangladesh either. Dhaka says there are already 400,000 Rohingyas living inside the country, most of them, it says illegally. Bangladesh has pushed nearly 1,500 Rohingya Muslims back into Burma since June saying it cannot afford to help them. Some - like the family of Zohara Khatun - have managed to get in. 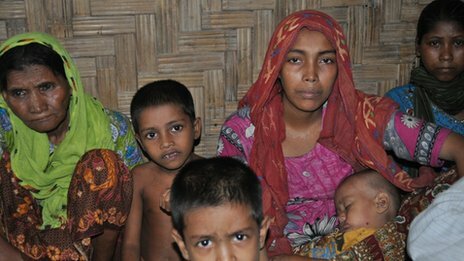 The Rohingyas who came recently have been living in hiding among Bangladeshi villagers. 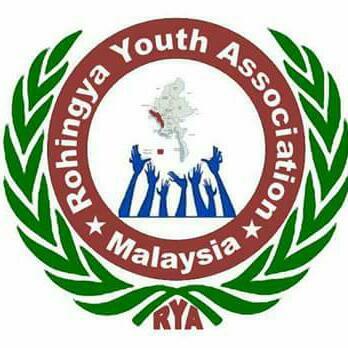 They are afraid that if the authorities come to know about them they will be sent back to Burma immediately. Bangladeshi authorities say they are determined to stop the latest influx. Lt Col Zahid Hasan of the Bangladeshi border guards showed me how his men have been patrolling the river Naf to prevent Rohingyas from crossing into the country. "It is really putting a direct effect on our social stability as well as the economy. If this influx continues then the problem of stability will be at stake," Col Hasan said. "Sometimes these Rohingya people are involved in drug trafficking, human trafficking and other anti-social activities which are really affecting the social stability in this area." The Rohingyas deny such allegations. The refugees I spoke to accused Burmese security forces of turning a blind eye when their villages came under attack. "My husband was killed in the riots. The Burmese police were shooting only at the Muslims, not the Buddhists. The military was just watching from the rooftop and they did not intervene," said Sayeda Begum, another Rohingya Muslim woman. Rohingya Muslims have flocked to Bangladesh over the past 30 years, bringing with them tales of oppression and exclusion. They are denied citizenship and land rights in Burma. Human rights groups say they are among the most persecuted minorities in the world. But Bangladesh's refusal to allow in the recent wave of refugees has also attracted criticism. "We understand it is not that easy. So we advocate with the government of Bangladesh to give at least temporary protection status to those arriving from Rakhine state of Myanmar [Burma]," said Dirk Hebecker, a senior official from the UN Refugee Agency in the Bangladeshi town of Cox's Bazaar. The Rohingyas who crossed into Bangladesh in the past three decades have been living in camps along the border. The unofficial refugee camps have no running water, drainage or health facilities. The Rohingyas live in abject poverty and squalor in these camps. The recent statement by Burmese President Thein Sein that the Rohingyas should be resettled in a third country has also added to the anxiety of Rohingya refugees in Bangladesh. "We are concerned by the president's comments. We belong to Burma and we want to go back to our villages. It is difficult to live in refugee camps like this," said Ahmed Hossain, a Rohingya community leader in Kutupalong camp, near Cox's Bazaar. "We are willing to go back to Burma only if our security and rights are guaranteed." For years, Bangladesh has been urging the Burmese authorities to take back the Rohingya refugees living in various camps but without much success. The latest crisis comes at a time when Burma is gradually moving towards democracy. But many here in Bangladesh argue that the process may not be complete unless the Rohingya issue is resolved.